Combine traditional styling with Andover's matte finish for ultimate comfort in your work environment. Thermally fused surfaces prevent nicks and scratches and showcase a beautiful Sherwood Mahogany finish. 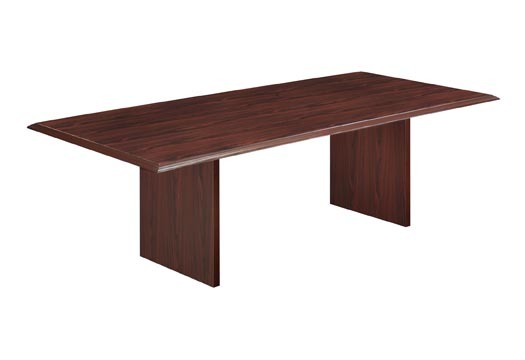 Large executive desks feature a 10î overhang for in-office conferencing. Tops - Constructed of thermally fused laminate and engraved wood materials. 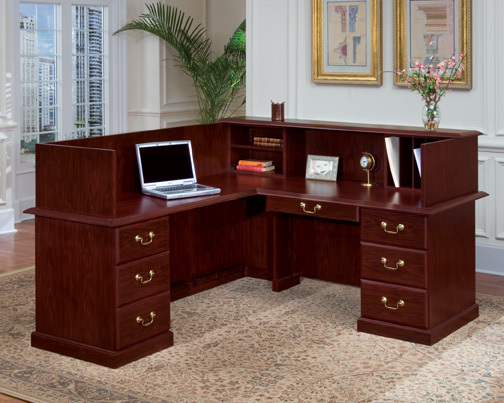 Construction - Desks, credenzas, file cabinets, and bookcases feature mortise and tenon, glued, stapled and screwed construction for maximum strength and durability. Chassis have a Sherwood Mahogany finish on wood materials.Chassis feature a UV top coat to protect against stains and scratches. Drawers - All drawers are suspended on metal slides. File drawers are fully extending, box drawers feature 3/4 extension. Medium density fiberboard drawer fronts and edges are grained to match the beauty of the top. Black drawer interiors are smooth and maintenance-free. Filing hardware is included for front-to-back, or side-to-side legal hanging files. Locking pedestals are all keyed the same. If you need specific items keyed differently, please contact your customer service representative. Adjustable Levelers - All cases are equipped with levelers. Specifications subject to change without notice. The simply styled Andover racetrack conference tables have a laminate construction, in a durable finish, offers value to fit any budget and any office solution. Andover Laminate finish is Sherwood Mahogany.